Having been described as an “apt performer,” by music critic Dr. Jennifer Iverson, Andrew Veit is a freelancing percussionist, educator, and composer in the Chicago area cultivating a private studio. He serves as the Director of Percussion Studies at Naperville North High School and William Fremd High School, and is in demand as a clinician having led educational seminars in New Jersey, Delaware, Indiana, Texas, Illinois, Iowa, Nebraska, Utah, and Ohio. In 2016 he earned a DMA from the University of Iowa, and also holds an MM from Texas A&M University – Commerce and a BA in music education from the University of Delaware. During his career Andrew has studied with many uniquely creative artists including Dr. Daniel Moore, Dr. Brian Zator, Jim Ancona, Orlando Cotto, Dr. Ted Hansen, and Leigh Howard Stevens. Since 2015 Andrew has severed as the Vice-President of the Heartland Marimba Festival, and has cultivated the organization’s growth through several strategies including his educational involvement during the festival’s yearly academy. There, he coaches chamber groups and individual lessons, and has appeared as a soloist on the HMF’s summer recital series. Andrew also publishes each of his original compositions through the HMF’s publications. Andrew was a member of the Cavaliers Drum and Bugle Corps and the Rhythm X Indoor Percussion Ensemble. He was also a staff member of the Jersey Surf Drum and Bugle Corps and the Penn State University Indoor Drumline, and has written for and instructed the University of Iowa Drumline and the Texas A&M University - Commerce front ensemble. Andrew’s can be heard on the Texas A&M University – Commerce’s album Epic Proportions, and has served on the PAS Marching Committee since 2014. 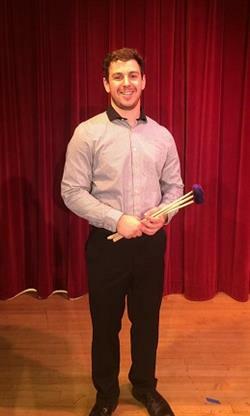 Andrew is a proud endorser of Innovative Percussion Sticks and Mallets.